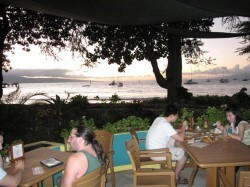 We ate at Aloha Mixed Plate restaurant which was highly recommended by our guidebook, but we were not that impressed. The restaurant has two sections – one section closer to the water, with better views (including a nice sunset view), does not serve alchohol. The other section, on a deck with limited ocean views, does serve. I had a mixed pupu plate with pork, and Wendy had some tasteless vegetarian noodles. Apart from the price, and great view, there was nothing else worth coming for. Maybe we got unlucky – but we weren’t in a hurry to come back. The service was good, and our waitress made sure that what they made for Wendy was truly vegetarian.